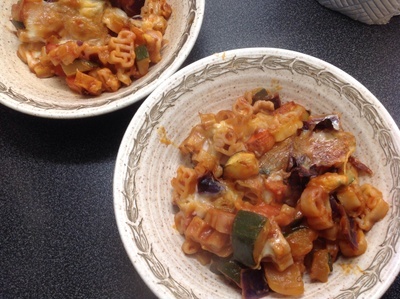 A pasta sauce is a good way to introduce new vegetables into your children's diet. 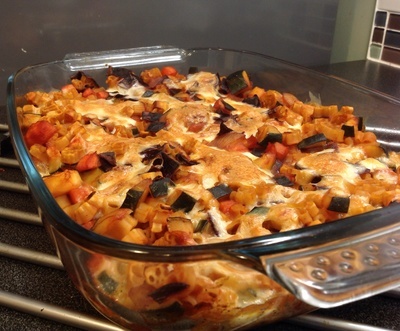 This one has both red cabbage and courgette in it. They are both vegetables that I would struggle to get my children to eat if I served them individually. However, in a baked pasta dish, with plenty of mozzarella on top, they both ate it quickly and even asked for second helpings. A note on spices: if you introduce gently spicy food to your children when they are quite young, then they will adapt to it better than if you leave it until later. My children now enjoy a pasta sauce that is spiced with about a teaspoon of chilli powder. By all means, if yours don't, leave it out. You could also start with a smaller amount or a different spice, like cumin, which has a pleasant flavour but is less hot. Bring water to boil in another pan and add the pasta. Chop up the onion, red onion, carrot, and garlic and cook them gently for a few minutes in the vegetable oil. 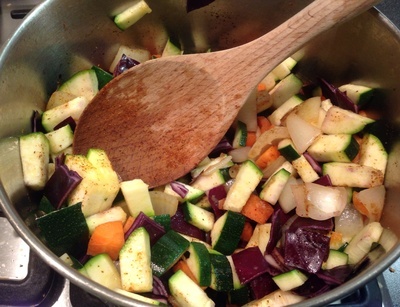 Chop the cabbage and courgette and add them to the vegetables. Season with 1 tsp of chilli powder and mix well. Cook for another few minutes. When the pasta is just becoming soft, take it off the heat, drain it, and set aside. 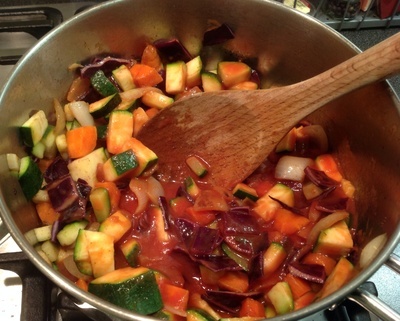 Add the passata and crumble the stock cube into the vegetable mixture. Cook for a few more minutes. 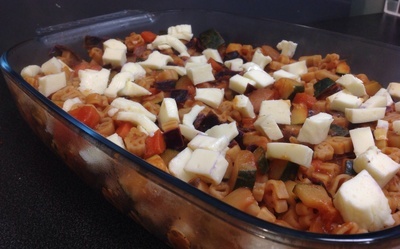 Tip the pasta into the vegetable pan and combine. Put the pasta and sauce into a large baking tray. Roughly chop the mozzarella and then spread it evenly across the top of the bake. Bake in the oven for 15-20 minutes until the cheese is melted and golden.